Another character in Dirty Shirt: A Boundary Waters Memoir is my daughter, Sarah. As I've mentioned, the book is structured in three parts. Parts one and two are about trips with friends and my brothers. The third part is about more recent trips we took with our children. These trips were meant, first and foremost, as family adventures, but also to instill in the kids a respect and appreciation for the BWCA. In 2009, we took our kids up for a short trip, three days and two nights. We wanted them to have a good experience, so kept it to one short portage and lots of fishing and cousin time. Sarah came along on that trip as well as the one in 2012. She has always loved to camp and that is only outdone by her love of fishing. 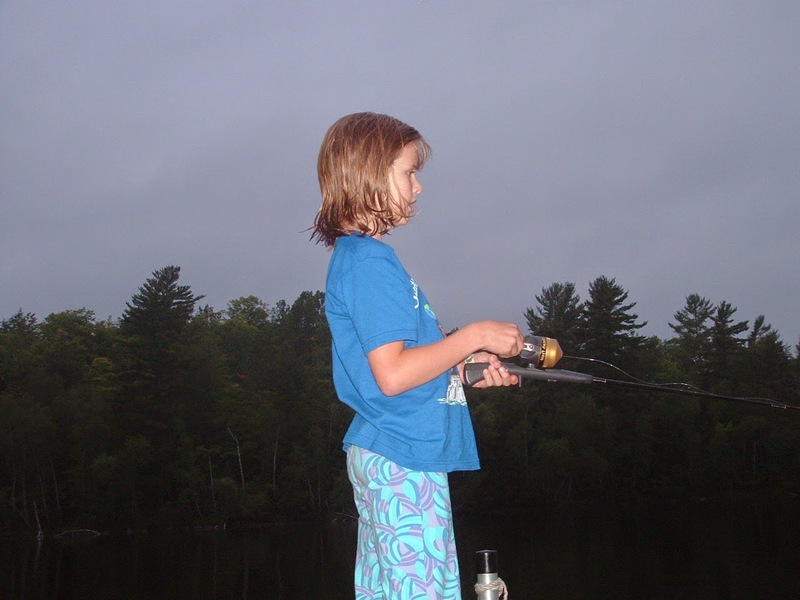 I've said it many times, but I remember her vividly as a four year-old sitting at the end of the dock fishing for hours, catching bluegills as fast as I could take them off. This made her a natural fit for fishing in the BWCA. While we caught a few walleyes during the trip of 2009, the 2012 trip brought much better fishing with it. It was such fun to watch her catch her fish on the days we had together in the canoe. She's got the fishing bug for sure. Sarah also does quite well in the BWCA because she knows how to "rough it" to live simply in sometimes rough conditions. When she was a freshman in High School she took a short-term mission trip to the Dominican Republic. There she saw how people lived simply and yet how happy they were, in some ways happier than those of us with much more. This exposure to poverty taught her much, I feel. It shaped her. She has a huge heart for people as it is, and this trip only made it bigger. Since then, she has been helping us serve at the Guest House homeless shelter in Milwaukee and in other places. She understands how blessed we are as a country and a culture. While Sarah has never been athletic, she more than makes up for that in academics. She's always been an overachiever in school and thankfully it has paid off. She was recently accepted at the University of Minnesota where she'll be studying as a Freshman in the Fall. She'll be studying Economics to start out with and will likely pursue International Relations or Foreign Languages at some level as well. She is fascinated with France and French culture, so my guess is that's in her near future as well. She'll go to far away places, I'm sure. I'll likely be travelling to Borneo to visit my grandchildren someday. She's not long for this country, I'm afraid. After being away for a couple of years now, Sarah has started to ask when we will get up to the BW again. While it won't happen this year, I think we need to get up there soon. The walleye are waiting. For more about Sarah's adventures in the Boundary Waters, you'll just have to read Dirty Shirt: A Boundary Waters Memoir.